As rebel doctors in Port Elizabeth take a stand for better services, denial, maladministration and corruption make the Eastern Cape Department of Health get sicker and sicker. MANDY DE WAAL investigates. In an unprecedented move, doctors in the Eastern Cape’s public healthcare system are halting city hospital procedures in an attempt to break a deadlock with the province’s department of health. Doctors in Port Elizabeth, desperate to do something about crippling staff shortages, non-payment of salaries and a crumbling health system, early this week held a media conference and issued an ultimatum to the Eastern Cape Department of Health. The rebel doctors at Dora Nginza, Livingstone and Provincial hospitals – which make up the Port Elizabeth Hospital Complex – say local government has placed a moratorium on the appointment of new junior doctors and specialist doctors. “Doctors who have left by attrition or resignation have not been replaced, despite there being willing, qualified applicants. To compound matters further, the salaries of a number of doctors who have worked on a sessional basis have not been paid since January,” the doctors said in a joint statement made to the media. The doctors, who held a press conference to address the media earlier this week, say they have repeatedly petitioned the department about the dire consequences, but that their pleas fell on deaf ears. “We have also written to the premier of the province, Mrs Noxolo Kiviet, and to the national minister of health, Dr Aaron Motsoaledi, appealing for them to intervene in the crisis – but to no avail,” the doctors say in their statement. The media conference was held to create public awareness about what the rebel doctors feel is a “dire situation” at these Port Elizabeth public hospitals. They say they have “jointly come to the conclusion that the only way in which we can deal with the serious staff shortage – which is beyond our control” is to curtail services. Though Kuphelo has angrily responded to the doctors breaking ranks, he hasn’t addressed one of what is a long list of grievances the doctors have raised with the provincial government. The drastic measures taken by the rebel doctors are symptomatic of chronic systemic failure that is widespread in the Eastern Cape public health structure. This is confirmed by the public interest law centre, Section27, which partners the Rural Health Advocacy Project, the Treatment Action Campaign, Africa Health Placements, Rural Rehabilitation South Africa, the Rural Doctors’ Association and the South African Medical Association. These organisations say they are receiving numerous reports from activists and healthcare professionals in the Eastern Cape about the rapid decline in the public health sector’s service delivery. Problems that are being reported include non-payment of doctors, nursing and other medical staff, drugs running out of stock and shortages of even the most basic medical supplies. Section27 says the reports point to widespread systemic failures in the management and financing of public health services in the province. The worst hit by the crumbling health system is marginalised people in rural areas, where healthcare teams are said to be small and extremely vulnerable. “The province is in a bad state,” says Daygan Eagar, a researcher at Section27 which, in part, works to reform the public health system by making it better and more affordable. Eagar has been researching the extent of the health system problem in the Eastern Cape, and its effect on people who can’t afford private medical care. 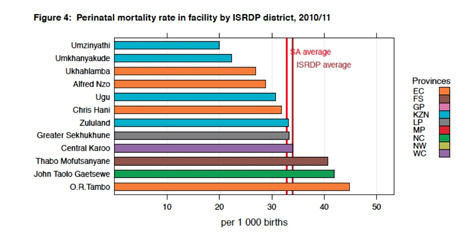 The Eastern Cape has 4 of the 10 districts with the highest maternal mortality rate in South Africa. “Come December, when you look at child deaths you will see a spike in that province. This will happen because public health facilities don’t have basic rehydration kits. In December, what you find is that intestinal diseases like diarrhoea are on the increase due to the summer rainfall, poor sanitation and poor access to soap and other cleaning materials. When children fall ill and go to basic clinics they can’t even access rehydration packs, or items like saline and rehydrate,” says Eagar. “Even where infrastructure has been developed, like in the case of clinics in rural areas, things like water and electricity aren’t being provided in time. Supportive infrastructure like roads and transport for people in rural areas isn’t improving. The supply of drugs and medical equipment to these facilities is extremely poor, and then the province is battling with massive corruption which is endemic in the province. This includes tender fraud, misappropriation of funds, and the mismanagement of funds,” says Eagar. When democracy came to South Africa, the Eastern Cape was given an unfair disadvantage in terms of health. The Eastern Cape is mostly rural and after 1994 incorporated the former homelands. When the provinces were divided up, most of the Cape healthcare administration (the experience and infrastructure) went to the Western Cape. The Eastern Cape mostly had to start new administration from scratch by mashing up what was left over from the former homelands and integrating it with what was left behind when it separated from the Western Cape. The result is experience that lags behind many of the other provinces and infrastructure that is significantly worse than what can be found elsewhere, in terms of clinics per person for the population. This means more pressure on fewer facilities in a province that doesn’t have the administrative skills to cope, where staff levels are crippling and infrastructure isn’t being maintained. In other words, a recipe for disaster. “Last year 29 babies died in Cecilia Makiwane Hospital (in Mdantsane),” says Kota, who adds that it is likely there were more deaths because deaths in hospitals are often under-reported. “You talk about a decline in the public health system, but it is a crisis, catastrophe. Our (public) hospitals are hospitals of death. I am of the view that we cannot give the ANC another 20 years of rule,” says Kota, who believes that the pain and suffering that poor and marginalised people have experienced during the past 18 years is enough. “I want only one reason as to why we must give ANC another 20 years. They are busy fighting over positions, they are so fragmented. They are fighting over our resources, positions go with resources,” says Kota, who believes the public healthcare system is a prime example of how the government is mismanaging infrastructure to the detriment of the poor. Meanwhile, Section27 says the Eastern Cape health department is dealing with budgetary shortfalls and backlogs by shifting spending. “The department has shifted spending away from capital expenditure. This is likely to create maintenance issues in the future and place an increasing burden on existing infrastructure,” Section27’s report states. The provincial health department and treasury have also implemented wide-scale austerity measures, which include a moratorium on new appointments, and the rationing of non-critical services. The treasury has done this without offering any notions about what returns it will get from this exercise and the cost it will extract in human terms. “Public healthcare in the Eastern Cape is in a dire state at the moment,” says John Cupido, Democratic Alliance shadow MEC of Health in that province. “About a month ago the legislature approved a R15.17-billion rand budget for the year, decreasing the health budget for the second time in two years. This last time it was decreased by R424-million, which is an immediate concern. But if you look at human resource deficits, we are looking at vacancies of 27,000, of which 16,000 are professional nurses. Just to fill those positions alone would require another R9-billion over and above the existing budget,” says Cupido. “We had a situation where we had an elderly gentleman who needed to be transferred from Matatiele to the hospital in Mthatha, but the hospital refused to send an ambulance because the facility was full. I got involved and started calling the department to try to help in the morning, but by that afternoon the man had passed away,” Cupido says. The shadow MEC tells a chilling story about what happens when equipment isn’t serviced or replaced. 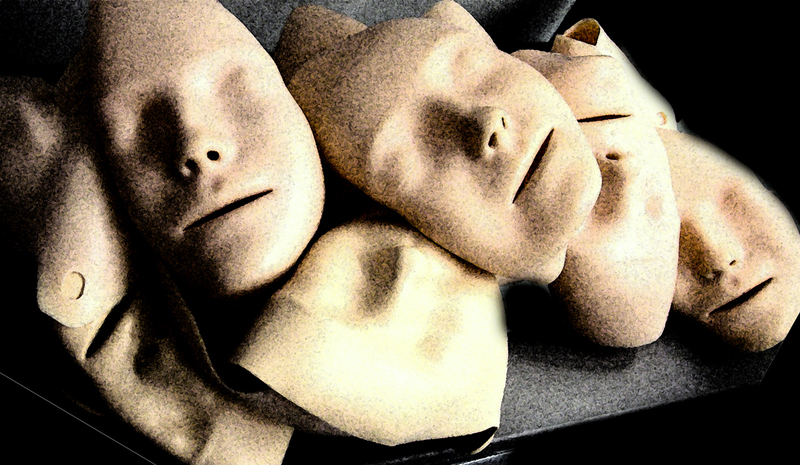 “I am talking about equipment as basic as a blood gas machine. If hospitals don’t have this they won’t be able to see how much oxygen a patient has in their blood, or how the chemicals are reacting with the blood. I know for instance that the only functional blood gas machine at Dora Nginza is sitting in the paediatric ICU. Every time doctors or nurses walk through from the adult ICU with their scrubs to get a reading from the blood gas machine, it brings a whole lot of potential infection for the paediatric babies. It is something you’ll never see in first-world countries,” Cupido adds.